BOOOOOOO ! ! ! ! ! best 6 — just in time for the deadline. I will be emailing my best 6 shortly, and while it was a tough decision as to what made the list, here they are. Additional pictures for the converse sheath variant are below–if other information about this piece comes to light, then I will provide an update. Reference ~ (Bull, 1999, 16) (O’Leary, 1999, 41) (Peters, 1999, 60). 2. Unusual prong puller with sheath. 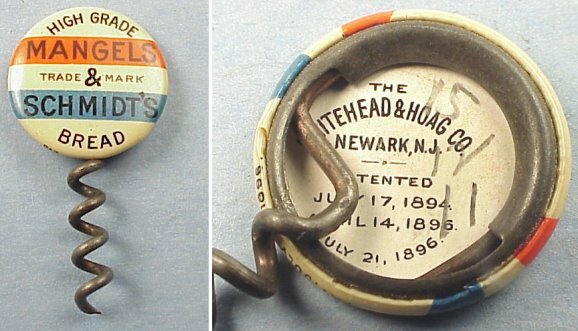 Similar to the Maschil Converse 1899 patent prongs, however instead of a wooden handle, it features a caplifter, and is marked “PATENT APPLIED FOR” on the prongs. 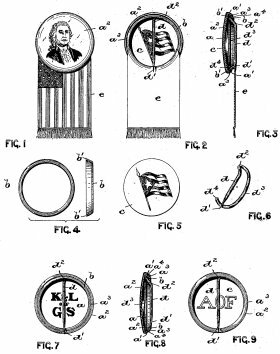 While no prongs are shown in the patent drawing, given the same sheath, and similar prongs to the more common version of the Converse, it would seem that this indeed is a Converse cork extractor, albeit an unusual variant under a combination of 1899 patents; 624,457 and 625,491. Reference ~ (Bull, 1999, 16) (O’Leary, 1999, 75) (Peters, 1999, 123). 4. Edward Thomason’s 1802 British Patent # 2617. The Thomason III, or Thomason Variant, carries a badge, which reads “THOMASON’S PATENT, NE PLUS ULTRA, ” on the barrel. Reference ~ (Bull, 1999, 159) (Wallis, 1997, 16). Reference ~ (Bull, 1999, 87) (Peters, 1999, 203) (Wallis, 1997, 85). 6 . Charles Chinnock’s American Patent # 35,362. The barrel version is marked “CHINNOCK’S PATENT MAY 27, 1862.” The open frame version is marked on the handle “PAT MAY 27, 18 ” with the year mostly obscured. Reference ~ (Bull, 1999, 16) (O’Leary, 1999, 33) (Peters, 1999, 106). Best 6 (+ 1) for 2008! I am still working on the text for the best 6 for 2008. But, feel free to check the picture below to see the chosen grouping. The Whitehead & Hoag button arrived, and it is quite cool. The patent information on the back, and the helix is sharp. A nice (albeit rather small) addition to the collection! And, this is the time of year that one’s best 6 is supposed to be turned in to the Quarterly Worme for publication. Mark finished his, as it is already available online, and mine… well, I am still struggling to figure out which corkscrews are the best 6 of the year. I will arrive at a decision later today (I think). For the rest of you… start snapping photos, the deadline is upon us. The lovely bride and I had a fabulous time in Paris! And, as one would guess we did spend some time hunting for corkscrews. On the first morning of my arrival, while the lovely was at a food show, I happened to walk up Rue St. Paul to find some fantastic corkscrews. A nice two pillar, a subito, and a great looking single lever. The shop was closed, but I did snap a picture. More about these in a moment. Sue finished up the food show in the afternoon, and we spent the rest of the day seeing the sights, and seeking out an appropriate place for dinner. We found just what we were looking for around the corner from our apartment; L’Epouvantail. The meal was fantastic! The next few mornings would start with a run through the streets of Paris, followed by a shower, breakfast, coffee, and then a long walk through the streets of Paris. Followed by wine, dinner, and wine. I did manage to check email in between hunting for corkscrews, and it was a good thing I did. I got an email from Ian & Sue Hunter who explained, they too were in Paris and asked if we wanted to meet up. We emailed back and forth about schedules, our locations, and corkscrews. Ian had seen the shop with the subito, and informed of the prices on the various corkscrews; 1000, 3300, & 7000 for the subito, single lever, and two pillar (ouch, no way, and you have got to be kidding). We decided to meet up after the Clignancourt market, and the lovely and I headed out to find a corkscrew. And, corkscrews were plentiful…however, they were also quite expensive. So, we rustled through baskets and boxes, peered into glass cases and finally found a couple of things that would be worth picking up. I passed on an early two pillar, a ornate folding bow, an empire, and several perilles. I did pick up an interesting champagne tap marked J Depagne, and tucked it in my backpack and headed off to the next booth. After visiting all the booths, and some of them three or four times, we hopped back on the Metro and headed back to the apartment. Sue went for a run, and I figured out where we would meet for dinner. We ultimately decided to go back to L’Epouvantail. We had closed the restaurant down with the owner the night before with much wine being consumed, and figured that Ian and Sue would enjoy it too. It didn’t disappoint as dinner was awesome. A wonderful few days (pictures below). we are back! pictures and tales of our adventures shortly. . . I head to the airport in a couple of hours, and will meet the lovely in Paris for a long weekend. She has been scouting the area around the apartment we rented there, in between attending the SIAL food show. Starting tomorrow afternoon however, the show will be over and the rest of our time will be dedicated to exploring Paris (and looking for one or two corkscrews). Speaking of corkscrews, the ICCA Auction is in full swing. Everyone should check it out. There are rare patents, a couple of syroco pieces, some fantastic carved corkscrews, pretty much something for everyone. ICCA Corkscrew Auction ! The lovely left for Paris on Saturday afternoon, and I will be joining her tomorrow. Apparently Jackson (the cat) thinks he should be going as well. The Boston Antiques Show is this weekend, and while there aren’t usually tons of corkscrews there, there is usually one or two. Most recently, I grabbed a Tiffany Sterling Roundlet there. So, whilst the lovely was at the gym, I headed out and saw what there was to see. There were several corkscrews, a german spring, the same overpriced grouping from the same overpriced dealer that has been there at every show since we moved to the Boston Area, the requisite blackington sterling boot corkscrew, and then a couple of pieces that made the trip worthwhile. 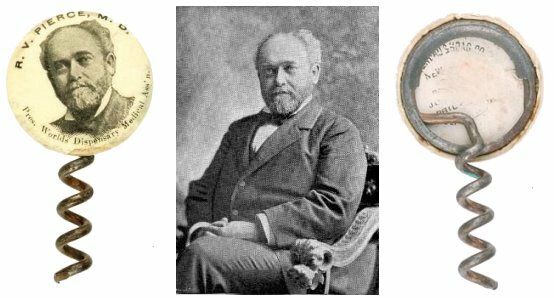 The two that ended up coming home with be are pictured below; an interesting anri bar set with a guy and his dog (it could be someone else’s dog), and a Bennit patent–the Bennit has a very different handle then what is usually found, but the bell is marked with the patent date. I will probably hold on to that one. The Anri, it will probably hit eBay next week. Some nice finds all in all, and there were a couple others as well (non corkscrew however, and also destined for eBay). While the countless corkscrew collectors on eBay are trying to convince the person that listed a Tucker patent corkscrew to sell offline, add a buy it now, or make a deal for the rarity, I was watching a corkscrew with a button. Or, rather… a button with a corkscrew. And, given that there were no bids from the time it was listed hours ago, you have to figure that buy it now, hey will you end it early, hey I’ll offer you a pittance for that rarity, or the please please please please sell it to me, emails had to have been inundating the seller. So, I put the item on my watch list–which fortunately I can see on my blackberry–and went about my biz. I snapped it up! And, just hung up with Mark to tell him about the piece. is heading to 16 Kingston. Funny thing is, that while I have been typing this, the person who apparently negotiated the buy it now called me laughing to congratulate me on picking it up. Thanks unnamed binning dude! ! !